Discounts on Paper Pumpkin Prepaid Subscriptions! | Midnight Crafting Midnight Crafting: Discounts on Paper Pumpkin Prepaid Subscriptions! 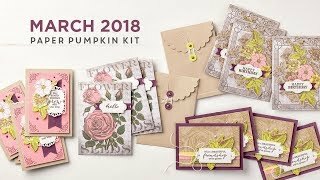 Love getting your Paper Pumpkin Kit each month?! You can take advantage of the savings with these prepaid subscription options Starting 4/23/14!! AND With Mother's Day just around the corner, it's a great time to take advantage of these prepaid subscriptions that can be bought as gifts. It's the gift that keeps on giving! Take advantage of the Discount!! When you purchase the discounted 6 or 12 month subscription, and enter the redemption code in your account, your pre-paid subscription will be used up before any more months are charged to your payment information! $ave on the Fun!! When your recipients redeem the subscriptions on www.mypaperpumpkin.com, they can put in payment information at checkout to keep receiving their monthly kits once the prepaid subscription ends (although they aren't required to give payment information!). 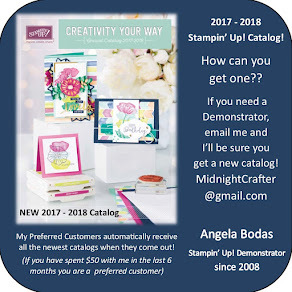 When you place an order in my online store at www.MidnightCrafter.StampinUp.net , you'll receive an e-mail with instructions on how to redeem the prepaid subscription. You’ll go (or you can share the code with someone to give it as a gift) to www.mypaperpumpkin.com and enter the redemption code. You’ll start enjoying your monthly Paper Pumpkin project kit the very next month!! This is an easy way to earn Hostess Rewards, when people buy Paper Pumpkin Subscriptions you will earn rewards just as if they were purchasing paper or stamps! Perfect for a catalog party, for your "non-crafty" friends, or those crafters who have "Everything". Think of all your friends who'd love to receive a project kit every month! You can get together and work on them for a fun craft night, a or gift them to relatives far away and share your completed projects. I love getting my paper pumpkin kit! Its exciting to receive it each month, everything already designed and prepped for me, and its fun to put together the projects - especially when I don’t have to do any work to get ready but Open the Box! If you’re nervous about committing, a three-month prepaid subscription is a good trial so you can learn how much you’ll love it!! If you are a current Paper Pumpkin subscriber, this is an awesome option now available. Consider a prepaid subscription as a gift for a friend! With Mother’s Day, Graduations, Birthdays, Bridal and Baby Showers, your gift can be the one that stands out! Busy people need easy craft breaks too!! The first Kit everyone receives, no matter what month they start, is the Welcome Kit! Suspend your subscription to be able to get the kit of the month when you wnat to start up again - if you Cancel and then restart, your first kit will be the Welcome Kit again!! Prepaid subscriptions can be made on all order types: workshop, customer, or online. Each Paper Pumpkin account can only use one redemption code at a time. For example, if someone buys two six-month prepaid subscriptions, they'll enter the first code and then after six months can enter the second code. When calculating an order which includes a prepaid subscription, remember that shipping is included-so you won't have to figure shipping for that item; however, you will need to include tax (use the hostess's tax rate). While not intended to be a gift subscription program, you can buy a prepaid subscription and give it as a gift. You'd just purchase the prepaid subscription and when you receive the redemption code, share it with the recipient of your choice who can redeem the subscription at www.mypaperpumpkin.com. Order online at www.MidnightCrafter.StampinUp.net today! Get your subscription discount AND a chance to win this months Hostess Rewards when you enter the Hostess Code QKJYRV4A on your order!